Extending the Yonge line won’t solve any problems for the TTC. Photo by Jason Cook in the Torontoist Flickr pool. We need to talk about this idea to extend the Yonge line up to Richmond Hill. Echoing Metrolinx, often word for word, York-region politicians argue that SmartTrack/GO-RER, the TTC subway extension to Vaughan, and automatic train control (ATC) will open up the needed capacity on the Yonge line. That’s not true. The Vaughan subway extension on the University-Spadina side is open—have you noticed congestion easing up anywhere? The ridership on SmartTrack, if it’s built, will be very small, wherever it draws from. But there are two further problems. First, the Yonge line north of Bloor is also over capacity in the morning rush, but this was not mentioned nor investigated by the Metrolinx study. It is now commonplace for trains as far north as Eglinton to leave passengers on the platform as the departing train doesn’t have enough room for all those waiting. The second problem is any and all solutions that might divert passengers from the Yonge line, including the relief line (long or short), only provide relief if there is no unmet demand near the Yonge line. This is unlikely. The new construction along Yonge, such as new residential and mixed-use towers at Lawrence and Eglinton, make it unlikelier still. Like we saw on King Street, if more room was opened up on the Yonge line and the experience of taking it resembled a sardine can less, new riders would likely appear. It is foolish to assume that diversion of some riders will leave permanent empty space on the trains that residents of Richmond Hill can claim. And it’s not clear that anyone has considered that the Eglinton Crosstown might add riders to the Yonge line as well. The TTC is a local transit service, paid for by its users (who are overwhelmingly Toronto residents) and municipal property taxes. Neither its network design nor its financial structure is designed to provide regional transit to neighbouring suburbs. The extension of the York University subway project across the municipal border into Vaughan has set an unusual precedent. It (along with the promise of SmartTrack/GO service at TTC fares) has upset the TTC’s longstanding commitment to a flat fare across the network. Because the TTC now covers the operating costs (at a significant loss) for a system and its riders outside the city of Toronto, it is vulnerable to discussions of fare-by-distance payment, which will disadvantage low-income Torontonians living outside the city centre. There is an argument that, given York University’s location, it is a destination for an area that extends into Peel and York Regions. I’m not sure that justified a TTC extension beyond the city’s boundaries, but at least it’s a legitimate point. There is no equivalent at Yonge and Steeles. I remain concerned about the demographic profile of those benefiting the most from the largest projects. Extending the subway past the university into Vaughan created new rail service into one of the wealthiest cities in the country. Choosing the one-stop Scarborough Subway Extension (SSE) instead of the LRT line to Centennial benefits Oxford Properties more than anyone. And the pattern continues with a proposal to build a new rail connection into Markham and Richmond Hill, towns with significantly higher household incomes than the City of Toronto’s. And like the other two examples, it would be for relatively few riders (lower even than the SSE). Moreover, for the latter examples of the Scarborough Town Centre and the Yonge line extension, rail connections already exist. Neither of these projects, therefore, makes a significant contribution to the overall transit network. In the case of Scarborough, the network will actually shrink by several stations. In the case of Markham and Richmond Hill, there is already GO train service to Union from Richmond Hill and Langstaff stations (as well as Old Cummer and Oriole within Toronto). If we seek a midtown destination for suburban commuters, we need to look at creating a midtown terminal, perhaps by reconsidering the rehabilitation of Summerhill, or take advantage of the forthcoming Crosstown to find other north–south corridors that can cross or terminate at Eglinton. That means rethinking the network as a whole. There are other good reasons to do that. We need to think more about how a Yonge line extension would impact to the overall network design. Specifically, extending the Yonge-University-Vaughan line will increase the unreliability and vulnerability of the line with the greatest number of passengers. One of the nicest aspects of the geography of Line 1 is its U shape. Instead of two separate north–south lines running from the top of the city to the lake, we have one line that bends like a hairpin and keeps on going. Travelling from St. George to a show at Massey Hall? You can ride around the loop to Queen instead of changing trains. Unfortunately, the U shape is also the system’s greatest weakness. It makes Line 1 an extremely long line. 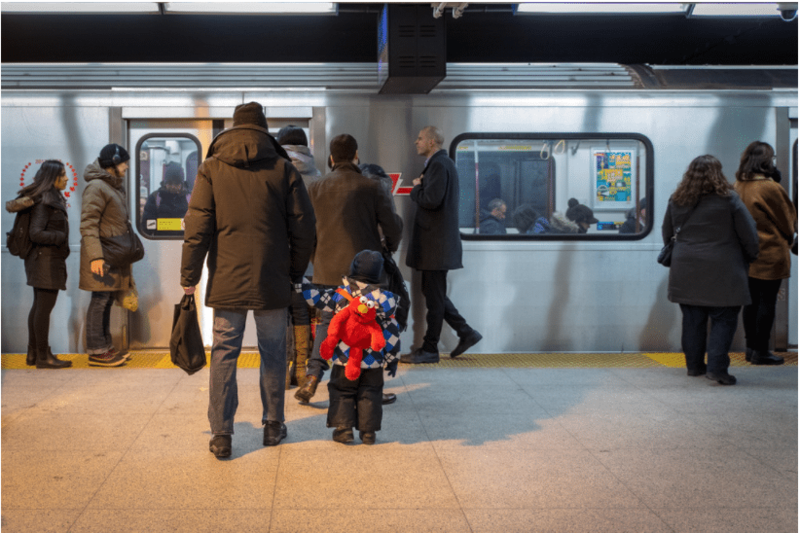 Having over 50 per cent of your subway ridership travelling on one line is a vulnerability. Carrying more passengers increases the possibility of passenger-related delays, and a delay at any one station can be a disruption for hundreds of thousands of riders. As many of us know intimately. A further problem of extending the line in a straight line north is that it makes no further connections with the rail network. When there are disruptions on either side of Line 1 north of Bloor, there are very few alternatives for riders. This can increase travel times significantly and it can increase platform congestion quickly and dangerously. A parallel line (LRT or bus rapid transit) along Bathurst, for example, that brought passengers to the Crosstown and the Bloor-Danforth line could be used to divert riders from both sides of Line 1. Not to dwell on the worst-case scenario, but it’s also worth remembering that transit systems sometimes have to cope with more than minor delays. An important goal of network expansion is to increase the flexibility, capacity, and efficiency of the network as a whole in order to give it resilience (see Yang et al 2017, Mattsson and Jenelius 2015, and Cats and Jenelius 2015). A serious incident, such as a power outage or flooding, may require an evacuation and rerouting of thousands of riders. Shuttling them up and down Yonge works poorly (as we already know) and there is no north–south corridor for Line 1 shuttle buses on the west side. Shuttling passengers quickly over to Bathurst and onto another line would be more efficient. Extending an already overly long line even further leaves the system less able to cope with disruptions, major or minor. It is not good for the TTC’s network design. The political pressures to build the Yonge line extension are significant—and it is already further advanced in its planning than the relief line. But it is a multi-billion-dollar project that raises serious problems for Toronto and the TTC in terms of congestion, complications of jurisdiction, and a weakening of the local transit network. There are other ways to address regional transit needs, and we should consider them instead of extending the Yonge line.